Here are our family ski reviews on the latest new skis for kids. Before you jump into buying new ski for your child, consider how many times you will ski this season. 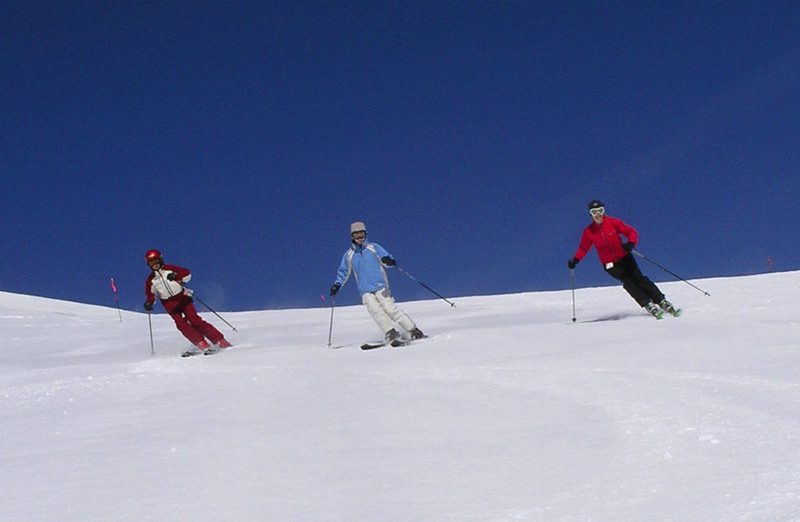 Kids grow fast and can grow out of their ski equipment in one ski season. So if you are only going to take the family skiing a few times, rent skis for your kids at the resort or a rental shop or buy from a ski shop that allows you to trade in your kids ski gear at the end of the year for a credit towards next year’s ski gear. Also consider buying used ski gear on eBay or Craig’s list, or a ski swap for your kids. Gently used kids ski equipment is for sale on eBay at discounted prices (just be sure to calculate shipping charges for skis), at ski shops and garage sales, this new to you gear will serve you just fine, and you can then sell it, make it a ski hand me down or give it to a neighbor, relative or friend for their kids learning to ski. If you are a season pass holder and take your family skiing every weekend and holiday, then buying ski equipment for your kids makes sense. Local ski shops offer great learn to ski and junior ski packages including snowboard or skis, bindings, boots and poles, often for about $200-300. While girly graphics on young ladies’ skis are very pretty, think about whether you will be handing them on to your son before going with the pink swirly patterns. Remember the most important piece of ski equipment is the ski boot, your kids ski feet need to be comfortable, warm and stable on the ski – not too tight or too loose so a proper ski boot fit for your child should be done by a pro ski boot fitter. Trying to squeeze an extra season with a poor fitting ski boot will only jeopardize your child’s ski stance, attitude and performance. Also see our tips on choosing the right length ski for your kids below. Rossignol S7 Pro Skis for kids are both great skis for kids learning to carve but also wanting to pop into the glades or powder with just the right dose of soft forgiveness and edge grip. Like the adult Rossignol S series, Rossi is making great all-mountain skis at affordable prices. The Rossi Scan Jr is another great ski pick for young skiers, with a rocker tip for easy turning and a wood composite core, this ski is durable, fun and forgiving for young rippers that weigh 45-90 pounds, available in the right ski length for your child 100, 110, 120, and 130. The graphics are white and blue, generic enough for girls or boys. Line Snow Angel for girls are very lovely looking, relatively fat skis, with cool pastel top sheets that will have your little girl wanting to cruise, not just stay in the lodge and drink hot cocoa. The wood core construction makes it stable, fun and fast for intermediate girl skiers, offered in a 100, 113, 123, 133 and 143 ski length. Atomic Vantage Junior packs a punch with their special Piste Rocker, so this junior ski performs well on hard pack but its forgiving and fun for your young skiers all over the mountain, offered in a 130, 140 and 150 millimeter kids ski length. K2 Indy Skis for girls or boys, in a 124 or 136 centimeter length, has cool named Noodle technology so its soft and supple but can still grip in a turn. Get the green/blue graphics so you can hand me down these Indy skis to your next kids – girl or boy. K2 Missy Skis for girls are so pretty in pink and purple, but also perform well with a rocker system in the tip and tail, and an aspen wood core for strong turning and grip characteristics. K2s Missy skis come in a 109 and 129 for young girls. K2s LuvBug girls skis are offered in a 124 with pink flowers, fun! K2 Juvy – your kids will want them just for the rebel name and gnarly color scheme, but these are great sturdy versatile boards for boys that like to ski groomers, glades, parks and a little pow too. Volkl RTM Junior is a dialed down version of the popular Volkl RTM, ride the mountain, adult ski. While the RTM junior ski top sheet won’t tempt your kid, very basic blue and black, the skis rips, carve and cruise through mixed snow very well.